August 11, 2016 - Representing the fastest successful recovery for any Endangered Species Act (ESA)-listed mammal in the United States, the U.S. 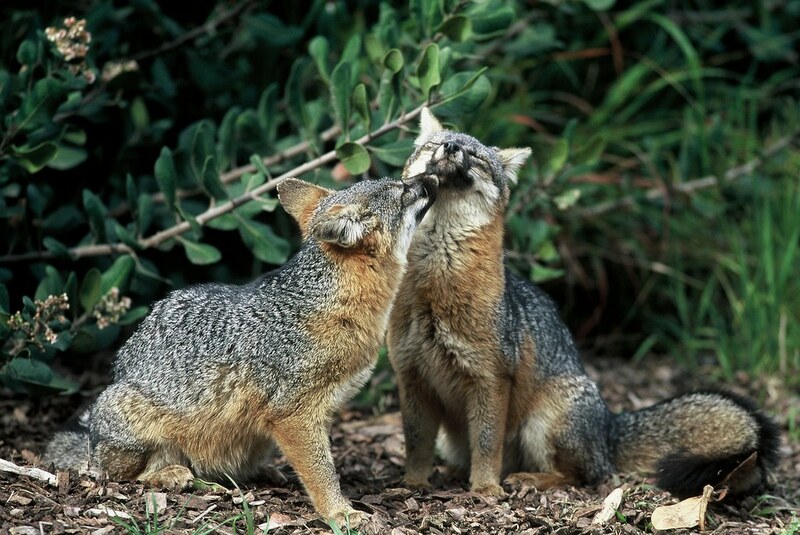 Fish and Wildlife Service (Service) today announced the final de-listing of three subspecies of island fox native to California's Channel Islands. The removal of the San Miguel, Santa Rosa and Santa Cruz Island fox subspecies from the List of Endangered and Threatened Wildlife brings the total number of ESA de-listings due to recovery to 37, with 19 of those overseen by the Obama administration. In the Act's 43-year history, more recoveries have been declared under the current Administration's watch than all past Administrations combined. "The Island Fox recovery is an incredible success story about the power of partnerships and the ability of collaborative conservation to correct course for a species on the brink of extinction," said U.S. Interior Secretary Sally Jewell, who visited Channel Islands National Park in March with fourth graders participating in the Every Kid in a Park program to witness fox conservation efforts. "The Endangered Species Act is an effective tool to protect imperiled wildlife so future generations benefit from the same abundance and diversity of animals and plants we enjoy today. What happened in record time at Channel Islands National Park can serve as a model for partnership-driven conservation efforts across the country." "It's remarkable to think that in 2004, these foxes were given a 50 percent chance of going extinct in the next decade. Yet here we are today, declaring three of the four subspecies recovered and the fourth on its way," said Service Director Dan Ashe. "That's the power of the ESA – not just to protect rare animals and plants on paper, but to drive focused conservation that gets dramatic results. More than 300 experts, non-profit organizations, state and federal agencies came together to not only prevent the extinction of Channel Island foxes, but to fully restore them in record time. That's something to celebrate!" "The decline of the island fox, one of America's rarest mammals, was rapid and severe," said National Park Service Director Jon Jarvis. "Captive rearing, an unprecedented emergency action was critical to saving the species. Efforts to restore balance to the island ecosystem ensured their survival." "The remarkably rapid recovery of the island fox shows the power of partnership, focus, and science," said Scott Morrison, Director of Conservation Science at The Nature Conservancy. "Many aspects of this recovery effort – from its scientific rigor to the collaborative enterprise that drove it – can serve as model to advance conservation elsewhere." The Endangered Species Act is an essential tool for conserving the nation's most at-risk wildlife, as well as the land and water on which they depend for habitat. The ESA has prevented more than 99 percent of the species listed from going extinct, serving as the critical safety net for wildlife that Congress intended when it passed the law more than 40 years ago. In addition, the ESA has helped move many species from the brink of extinction to the path to recovery, including California condors, Florida panthers and whooping cranes. The Obama Administration has delisted more species due to recovery than any prior administration, including the Oregon Chub, Virginia northern flying squirrel, brown pelican and now three Channel Islands Fox subspecies.